BEIJING (Reuters) - Japanese carmaker Nissan Motor Co <7201.T> is going for a facelift to stand out from the crowd. 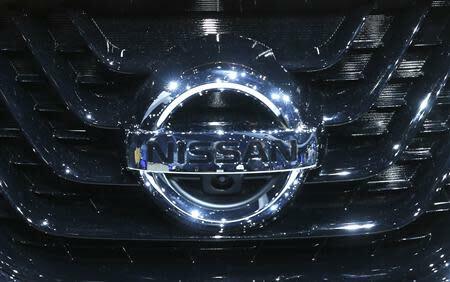 In an increasingly competitive global market - in China alone there are some 80 automakers battling for sales - Nissan plans to put a V-shaped front grille design on most of its models to give itself a "distinct, unified face", says global design chief Shiro Nakamura. "Before, we didn't really feel a pressing need for unified looks, but the number of brands is on the rise sharply in China, and there are simply too many different faces," Nakamura told Reuters in a recent interview. "Unless you unify your brand's looks across your whole portfolio ... you don't get noticed." The V-shaped grille has a thick chrome bar that cuts into the bumper, with its two side lines sweeping upwards and integrating the hood and the headlamps. "V-motion is a testament to our resolve to be loud with our visual presence. We realize we've been a bit too modest," Nakamura said, adding that while this is a global strategy for the Nissan brand, it's especially relevant in China. The new design is also Nissan's response to competition from Volkswagen AG - whose stable also includes Audi, Seat, Skoda, Bentley, Bugatti, Lamborghini and Porsche - which has been driving a more unified look across its mainstream VW, Skoda and Seat brands. The German group's strategy has become a "new brand-management standard" for global automakers, said Nakamura, noting others, such as South Korea's Kia Motors Corp <000270.KS>, were following suit. "The whole global auto industry is being impacted by Volkswagen's strategy," he said. "Unless you match that, your brand identity gets watered down." Bumsuk Lim, a professor of transportation design at the Art Center College of Design in Pasadena, California, said that under Nakamura, Nissan created a clean, dynamic identity. "Now, Nissan is looking to go to a next stage ... they're trying to develop a new identity. Why? Because everybody else came up with a new, more identifiable family look," he said. "The competition is tougher than ever, so Nissan is looking for a way to make a more powerful statement with its design." "With cars, everything starts with the grille." Nissan is expected to unveil the latest evolution of its "V-motion" grille design on a new concept car at the Beijing auto show, which opens on Sunday. The new look won't be on all Nissan vehicles, though, with pickup trucks, micro-mini cars sold mostly in Japan, and even some of the brand's mainstream cars and crossover SUVs, like the boxy Cube, excluded, Nakamura said. The "V-motion" look began as a design exercise at Nissan, fronting the Resonance, a show car unveiled at the 2013 Detroit auto show, then evolving into the Friend-Me concept shown in Shanghai last year, and later displayed on the Nissan Sports Sedan Concept at the Detroit show in January of this year. The concept car to be unveiled in Beijing is a close-to-final production version of the Friend-Me, executives familiar with the move said. Nakamura said Nissan plans to start selling a mass-market version of the car in China and elsewhere in 2015. He declined to elaborate. Nissan increased its global sales by 3.1 percent last year to 5.1 million vehicles. In China, sales of Nissan, Infiniti and Venucia - a joint venture with Dongfeng Automobile <600006.SS> - brands rose by almost a fifth last year to 963,117 vehicles, giving it 5.7 percent market share, according to LMC Automotive data.